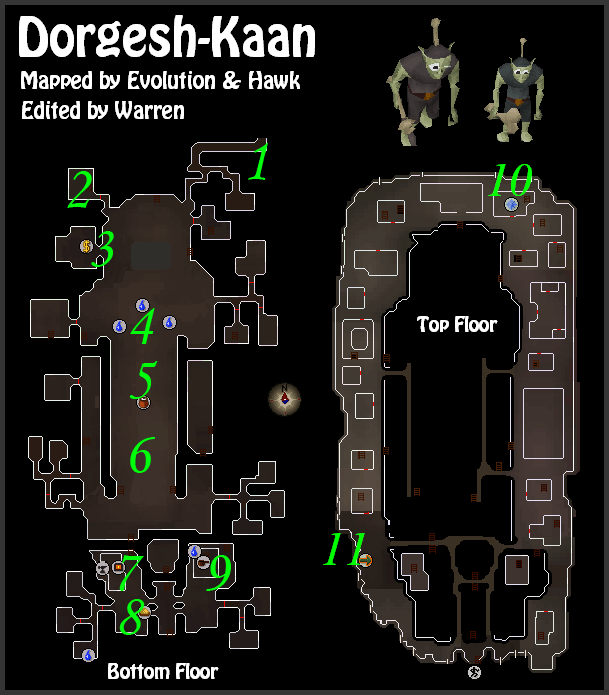 Dorgesh-Kaan is a small underground town, reached by going through Lumbridge Swamp Cave. It is inhabited by many Dorgeshuun Goblins and can be accessed upon completion of the Death To The Dorgeshuun quest. Dorgesh-Kaan was disclosed to the public before it's release date in March 2007. Use the Home Teleport to reach the courtyard of Lumbridge Castle. 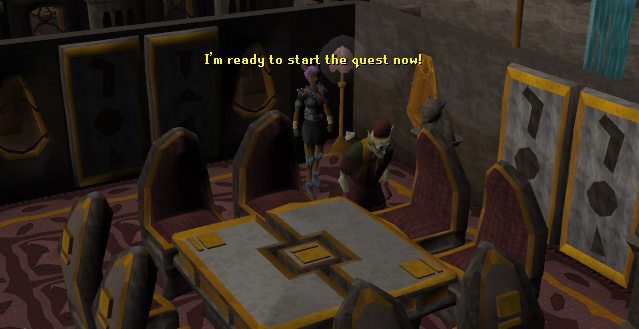 Walk into the castle and direct your character into the castle kitchen. Climb down the trapdoor and walk toward the southeast corner. 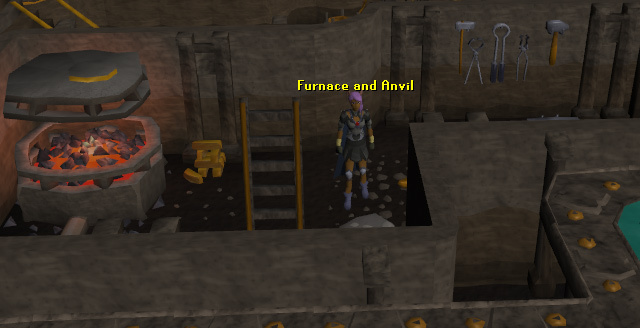 You will notice a hole that leads into the Lumbridge Swamp Cave. It is recommended you have a light source to further navigate your way through the caves. Climb through the hole and located the goblin named Kazgar. Speak with him and he will take you to the Dorgeshuun mines. Upon your arrival, work your way south to a set of bone gates. 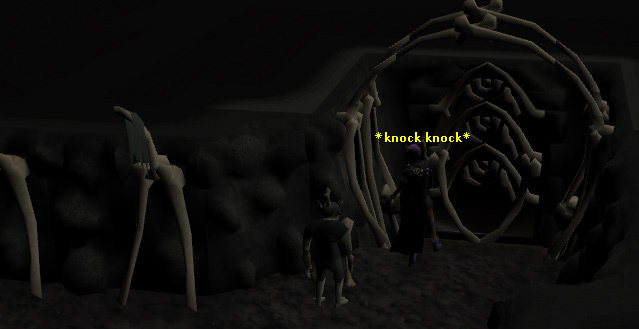 Open the gates to enter Dorgesh-Kaan. This method requires no Magic Level or Runes. 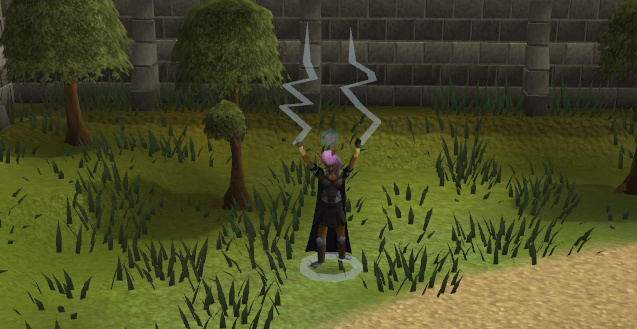 Use the Lumbridge Teleport spell to reach the courtyard of Lumbridge Castle. Follow the same steps as explained in method one to reach the town. This method requires level 31 Magic, three air runes, one law rune, and one earth rune. You can use Fairy Rings to get to Dorgeshuun-Kaan, the code is AJQ. This will put you in the Dorgeshun cave. This is where the new Slayer monster is. 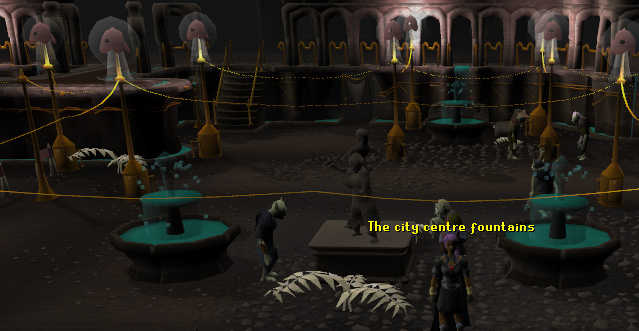 You must head north to enter Dorgesh-kaan. If you take one molten glass and two law runes to Orlak, who is a goblin in the city, he will make you a 'moving-place-device'. Basically, this is an orb that, when broken, teleports you into a random place within Dorgesh-Kaan. Orlak will make as many as you want as long as you supply all the materials. This is the way in and out of the city if you are going to use the Dorgeshuun mine route. There is a level 26 Goblin Guard here as well if you feel like killing one of the cave goblins. 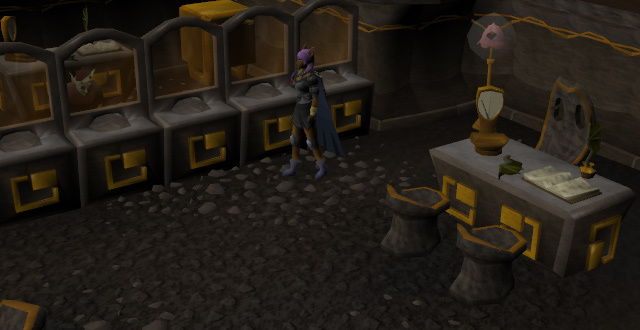 This is where you come to get your special Dorgesh-Kaan teleport made. If you bring two law runes and 1 molten glass to him he will make you the special Dorgush-kaan teleport. This functions like a normal bank and you can deposit or withdraw your items from here. These work like any other place for you to fill up jugs, vials or buckets with water. This is the Dorgesh-Kaan take on a general store. This is the stock amount of items in the shop. The Dorgush-Kaan market is a bustling and busy place for any surface-dweller attempting to make a small fortune. 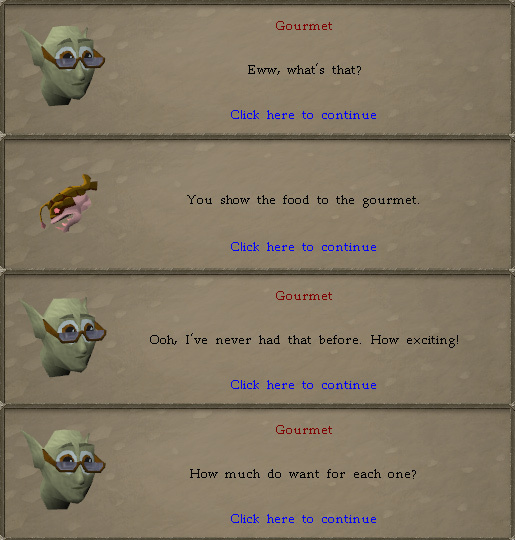 Bartering with the Gourmet goblins is an art in its own right. Before you can sell food to the 'Gourmet' you must gain permission from the council member. This will be explained later on. The best way to make money off them is to go to every single 'Gourmet' and offer a good price. Keep bartering until they accept that price. Remember each price they offer. Once you have gone through each one go back to the one that offered the most. If done right you can sell food for much over its real value, though it can be hard to get some of them to settle on prices. Once you have sold your food it is suggested that you use a new type of food and re-do the process. The next person in the marketplace, who is worth talking too, is Reldak. He is the goblin, constantly, shouting 'Leather!'. He can sell you frog-skin leather armour. The armour itself is not the greatest, but for price to strength ratio, it is not a bad piece of armour. 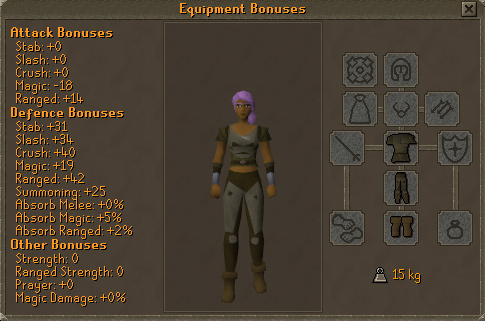 The stock amount of armour is 50 for each piece of equipment. Another person worth trading with down here is Miltog. She sells lamps, lanterns and the magic goblin mining helmet at a very reasonable price. 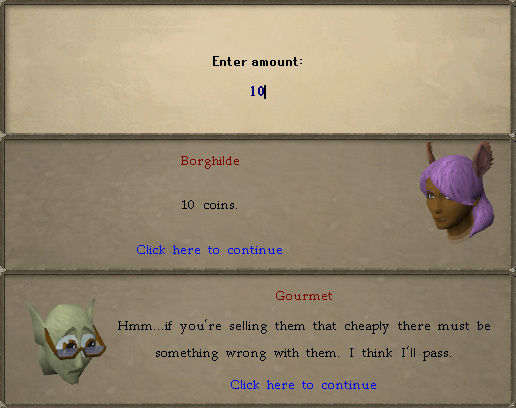 Durgok: He sells Frogburgers for 10gp, they heal 20 Life Points. Gundick: He sells spicy bat-meat kebab for 10gp, they heal 20 Life Points. Tindar: He will sell you crispy frogs legs for 10gp, they heal 20 Life Points. Zenkog: He will sell you wall-beast fingers for 10gp, they heal 20 Life Points. Markog: He will sell you frogspawn gumbo for 10gp, they heal 20 Life Points. 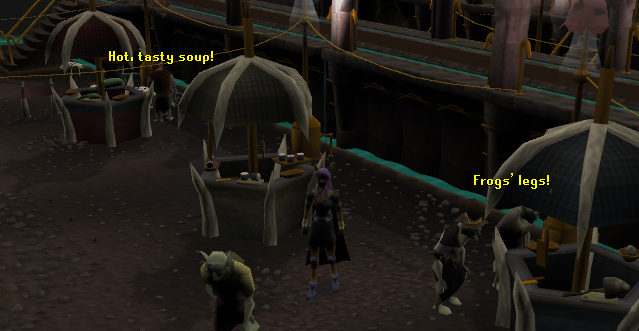 Zurgok: He will sell you green gloop soup for 10gp, they heal 20 Life Points. This is a furnace that many people do not find useful. 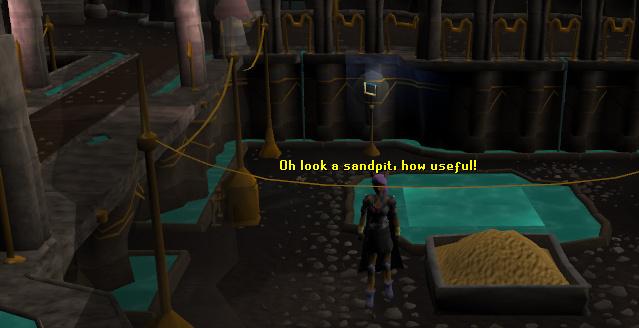 Nearby, there is a useful sandpit for sand collecting. If you, already, have soda ash, all you have to do is take the ash and a bucket of sand and make your glass. This can only be used for crafting and not for smelting. This is a useful sandpit for those who have not yet completed Hand in the Sand. It is relatively close to a bank. With a furnace nearby, you can make molten glass and bank it quickly, if you bring some ash with you. Here you can find a normal range. This range is more useful when glassmaking, because of the sandpit and furnace in the city. Players can burn their seaweed into soda ash and create molten glass at the furnace. Of course, this range is still useful for all your cooking needs. (10) Another Slice of H.A.M. This building contains Ur-Tag and Ambassador Alvijar. Both of these goblins are the start point for the quest, Another Slice of H.A.M. The attraction with the transportation symbol on your minimap it is a doorway. Players who have completed the quest, Another Slice of H.A.M, will be able to enter this doorway and use the train that transports players to and from the dwarven city, Keldagrim. To use the train, simply walk onto it and wait about 20 seconds for it to take off. This train ride, due to you being involved in the creation, is free of charge. 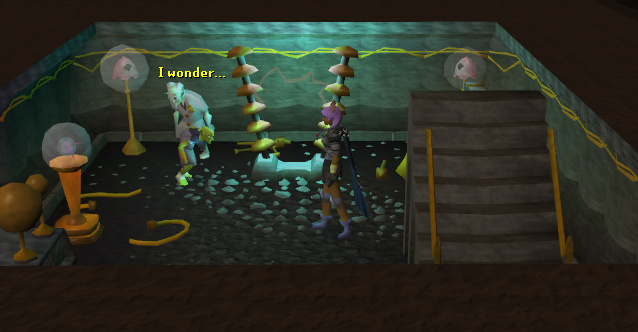 There are many NPC's in Dorgesh-Kaan. They range from technicians, villagers and even members of the High Council! Ur-taal - He is normally found in the main complex of the city just South-East of Oldak's room. Ur-zek - He is generally found in the main complex of the city just South East of Oldak's room. Ur-vaas - He is found North East of the market. Ur-meg - She is found in a room that can be found by going South of the market and then West. Ur-lun - He is found in the room South East of the range. Ur-pel - He is located in the room South East of the range. Ur-tag - He is located in a room at the North East of the second floor. Zanik has been a busy girl since your last encounter. She had been attempting to decode Juna's message and has been persuading the High Council to let 'surface-dwellers' into Dorgesh-Kaan. She is hard to find as she has been helping Oldak. Because she helps Oldak, she has many of his Dorgesh-Kaan teleports. After a while, she will break the device and teleport to somewhere else in Dorgesh-Kaan. He is the head engineer and mechanic of Dorgesh-Kaan but unfortunately because of this great responsibility he is a bit paranoid. Try not to make him too tense! He is a bone collector. 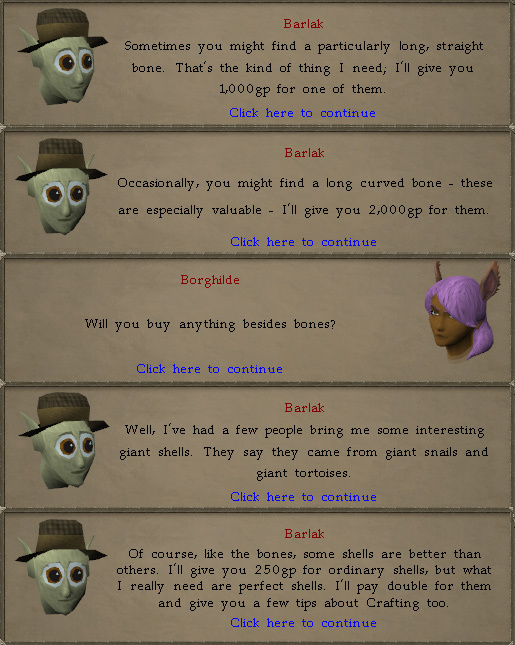 Barlak will pay 1000 coins for the long straight bones and 2000 coins for the big curving bones. You get these bones from monsters that drop big bones. When you trade him the bones, he will, also, tell you how he uses bones in Construction and will give you some Construction experience, as long as you already have 30 construction. He is not only interested in bones. He, also, wishes to buy your shells. He wants the shells you get from snails and large tortoises. He will buy normal shells for 250 coins and 'perfect' ones for 500 coins. you can find him in a room at the end of the hallway just west of the marketplace. 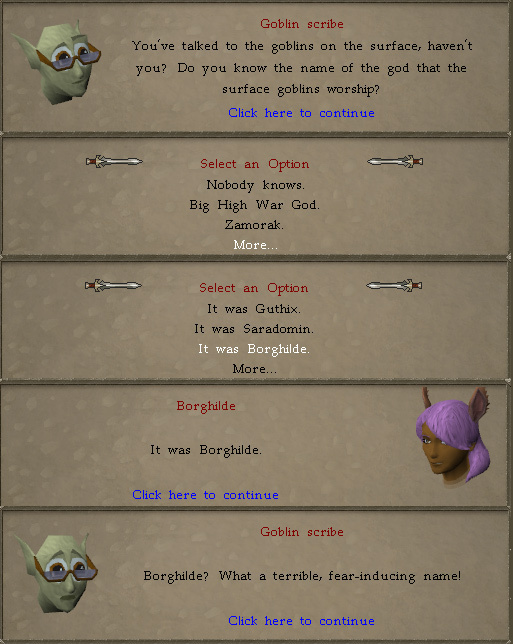 He has travelled all the way from Keldagrim to meet with the goblins. He tells you that the Dwarves and Cave Goblins are trying to make some trade agreement. He tells you that the only trade problem is the distance between the two cities. He hints towards some kind of system for trading, i.e. another cart system. He is also the person you can talk to start Another Slice of H.A.M. She runs the Dorgesh-Kaan nursery and shows cave goblins important attractions on a good union. She tries to introduce you to the children, but they do not seem to care. She is honoured to meet you once she realizes who you are. These little blighters are generally rude to you. They comment on how you look funny, 'all tall and skinny with tiny eyes'. Some, however, are very fascinated about you being the surface-dweller who saved their city. He runs the power stations. He is near the entrance to the agility area. He supervises all the actions and makes sure the people of Dorgesh-Kaan have enough magical power. He has the monotonous job of turning the spit roast. When you ask him for some of his roast, he will tell you that it is not ready, and that you should go to the market if you want some Dorgesh-Kaan food. They always drop bones and their other drops include: 12 coins, tinderboxes, oil lanterns and bone clubs. They always drop bones and their other drops include: 12 coins, iron chainbody and bone spear.